Coyotes are common in rural and urban areas statewide. However, the Arizona Game and Fish Department does not respond to calls to relocate or remove nuisance wildlife and will only do so to preserve public safety. Those needing assistance relocating nuisance wildlife should contact a licensed wildlife removal business. Coyotes are curious, clever and adaptable, and will take advantage of any food source. Yards with abundant fruit on the ground, pet food, unsecured garbage cans or unattended pets such as small dogs and cats are often easy food sources for coyotes. Coyotes may consider larger or loud dogs to be a threat to their territory and become aggressive toward them. Coyotes have lured and attacked dogs that are off-leash and bold coyotes have attacked small dogs on retractable leashes. Generally, coyotes frequent a home or neighborhood if they find food, water or shelter. Food can include unattended pets, birds or rodents attracted to bird feeders, pet food, garbage or fallen fruit. Water sources can include a pet’s water bowl or a swimming pool. Shelter can include a storm drain or any cave-like area beneath a shed, a porch or unused building. If you see a coyote near your home, don’t ignore it. The coyote may lose its natural fear of humans, which can eventually lead to bold behavior. Make loud noises, but DO NOT turn and run away, the animal may view it as an opportunity to chase. Move toward other people, a building or an area with activity. If a coyote is approaching a person or has bitten a person seek medical attention by calling 911. Anyone bitten by a coyote must immediately seek medical attention from a qualified health care provider. Also call your local Arizona Game and Fish Department office, (8 a.m.-5 p.m., Mon-Fri excluding holidays). After hours and weekends, a radio dispatcher is available at (623) 236-7201. Coyotes will return to the same area if attractants such as readily available food and water are not removed. Homeowners may trap and relocate coyotes, but must contact the Arizona Game and Fish Department for an appropriate release location before transporting the animal. Homeowners can also hire a wildlife control business to capture and remove coyotes for a fee. Remove attractants outside your home, including garbage, pet food, water sources and bird feeders that can attract rodents and birds for coyotes to eat. Never feed wildlife. It is unlawful to feed coyotes in Maricopa, Pinal and Pima counties per Arizona Revised Statute 13-2927. Violations can result in a fine of up to $300. Keep poultry, rabbits and rodents in secure enclosures. When you encounter coyotes while walking a small pet, pick up your pet, and leave the area. Symptoms of this disease include foaming at the mouth, erratic or hyperactive behavior and/or fearful, paralyzed or lethargic behavior. Call 911 or your closest Arizona Game and Fish Department office immediately if you see any animal with rabies symptoms. This viral disease consists of fever, eye and nose discharge, loss of appetite and coughing. It can be transmitted to and from dogs through bodily fluids. Symptoms can appear similar to those of rabies. Coyotes can serve as carriers of this type of heartworm, which is spread among dogs by mosquitoes. Coyotes may be a host for the itch or mange mite. Female mites can burrow into the skin. Coyotes with mange can lose their hair, which can make it difficult for them to control their body temperatures. Mange must be extremely severe before it disables a coyote. Most coyotes can survive with the disease for a long time. Transmission to dogs is possible through direct contact. 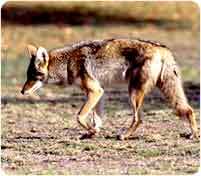 Coyotes can carry dog tapeworm, which can cause hydatid cyst disease in humans. State law bans firing a gun within a quarter-mile of an occupied residence or building while taking wildlife, unless you have the owner’s permission. Check your local city ordinances, but most ban shooting firearms within city limits. Some cities ban using slingshots, BB guns, air guns or bows. For property damage, refer to ARS 17-239 on wildlife depredation, in addition to Arizona Game and Fish Department Hunting Regulations.